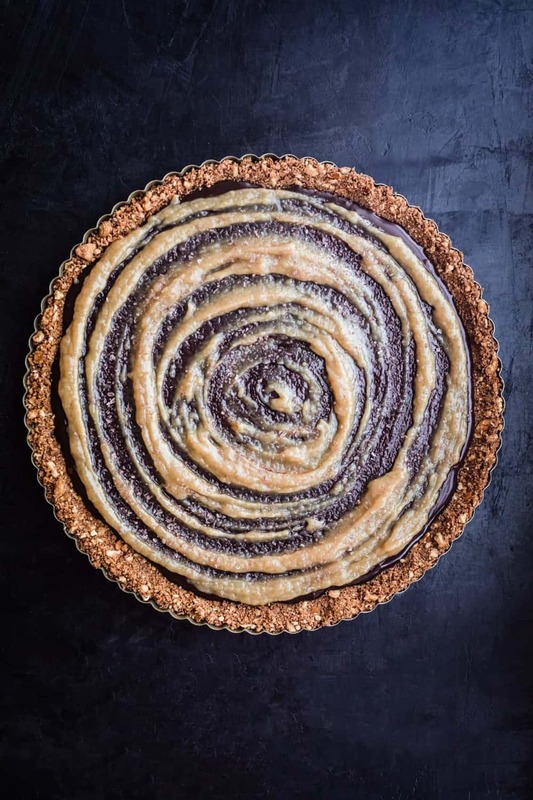 Please meet this luxuriously decadent and sophisticated chocolate tahini tart with a pretzel crust that’s easy to make and divine to eat! 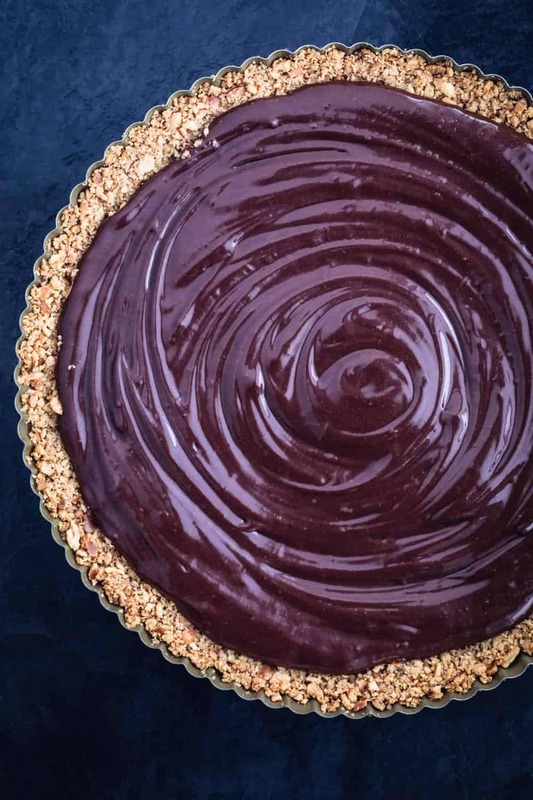 This tart is the chocolate dessert that my chocolate tahini dreams are made of. It’s like the mature older sister of my chocolate ganache tart. Going with a pretzel crust means there’s no dough to roll out and a nice salty crunch to balance the bitterness in the chocolate. 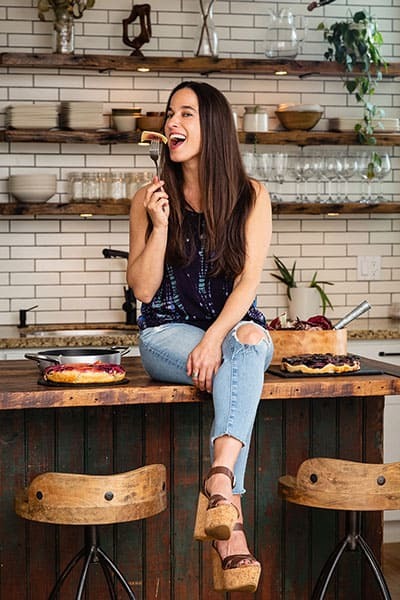 Adding tahini to a classic chocolate ganache tart adds a sophisticated and unexpectedly fun twist to this classic dessert. That tahini swirl on top! Just wow! Tahini, (also know as tahina), is a paste made of ground-up toasted sesame seeds. If you’ve never had it before, think of it as peanut butter, but instead of being made up of peanuts, it’s made up of sesame seeds (duh!). Howeva, if you’ve ever had hummus then you’ve def had tahini, since good hummus is pretty much half made out of tahini (the other half being garbanzo beans). I always say that the secret to really, really, really good hummus is the tahini. Not all tahini are created equal. Traditionally, tahini tends to make its appearance most frequently savory-style but lately I’ve really enjoyed experimenting with tahini in all sorts of sweet-style ways. Swirling tahini into cakes and brownies, baking it into cookies, or mixing it into a glaze. Chocolate and tahini go together like…well just like chocolate and peanut butter I’d say. Or perhaps a better analogy would be to stay that chocolate & tahini is the nutella of the sesame world. Does that make sense? Nutella is hazelnuts & chocolate. Tahini is sesame & chocolate. Ya dig? Ya drooling yet? The inspiration for this tart started out as this Chocolate Bundt Cake with a Sweet Tahini Glaze I made for a dinner party the other night. Every guests asked if I had a leftover glaze so they could smear more on their cake. They made it exceptionally clear that the glaze was the star of the show and wanted more of it. “Can you try mixing it into the batter before baking?” someone asked. “How can I increase the ratio of this tahini to chocolate in every bite?” asked another. Ok, that last question might have not been verbatim, as I’m not sure my dinner party guests speak like that after multiple glasses of wine, but ya get the idea. The dinner party ended and I was left dreaming up a chocolate tahini combo where there was more tahini deliciousness in every bit. 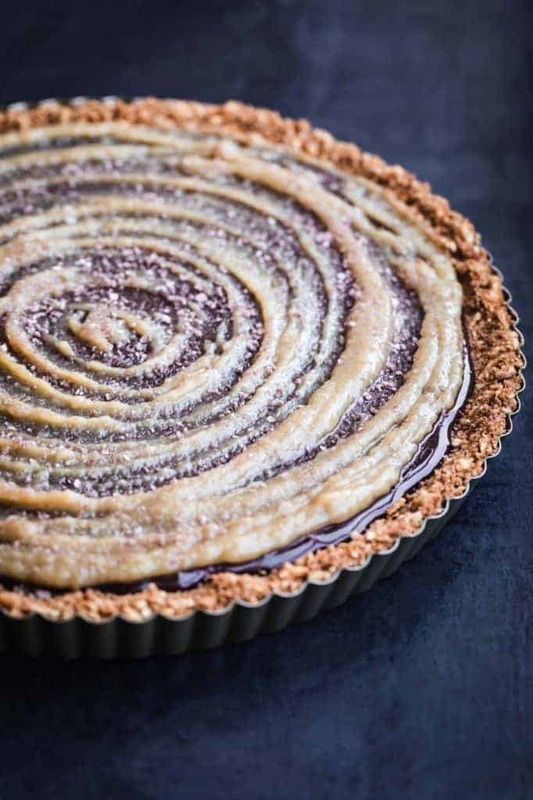 This tahini chocolate tart was the answer of to those dreams. There’s tahini mixed into the chocolate ganache (chocolate ganache just means chocolate mixed with cream in case you think I’m getting all fancy here) and then a sweet tahini glaze swirled on top. If you’re in a rush you can skip the tahini swirl topping. It’s a lovely addition, especially aesthetically, (who doesn’t love a good swirl?) but not necessary if you’re between making the tart sans swirl and not making it at all. I needed a crust to hold my chocolate tahini filled goodness. The vehicle to carry it all, if you will. All sorts of options will work but I’ve settled on this pretzel crust. It’s salty and sweet and crunchy and oh so easy to make (just place all ingredients in the bowl of a food processor!). If you have other crust ideas (graham cracker? chocolate pretzel?) I’d absolutely love to hear in the comments below! 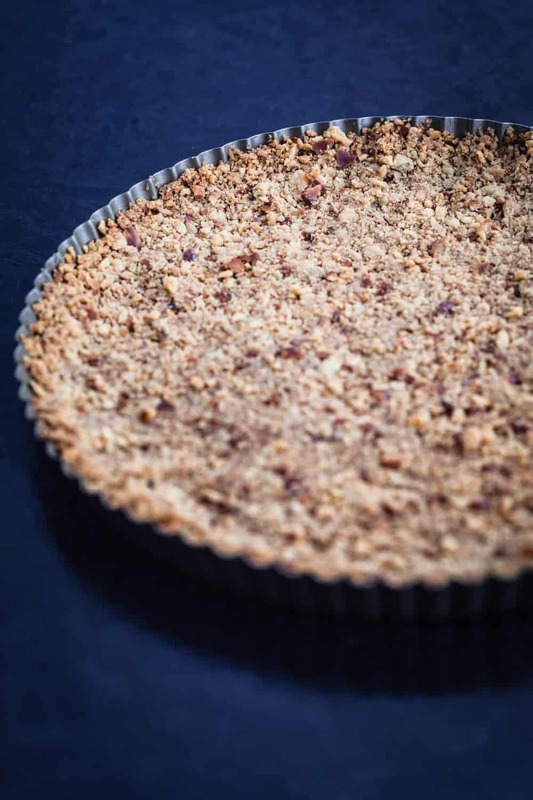 Let’s get our chocolate tahini tart crust exploration game on I say! Please see my step-by-step guide with the corresponding pics below. Measure 1 1/2 cups of pretzels. 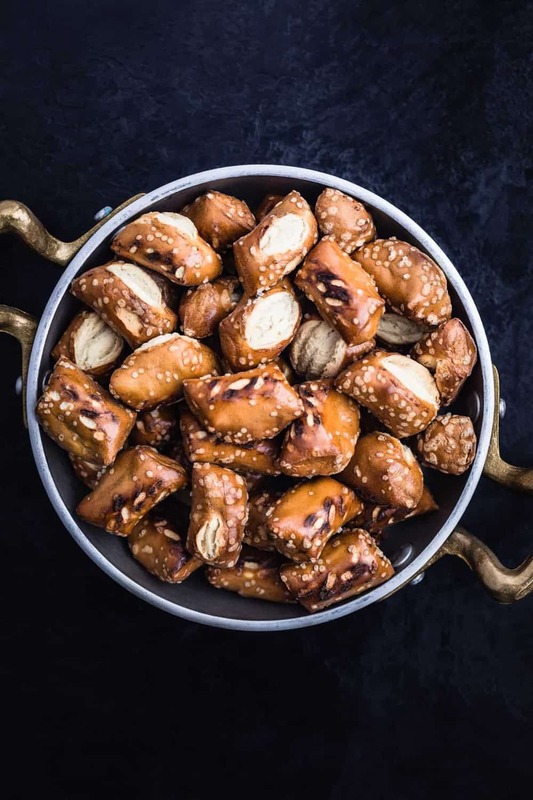 Pulse pretzels with butter and sugar. 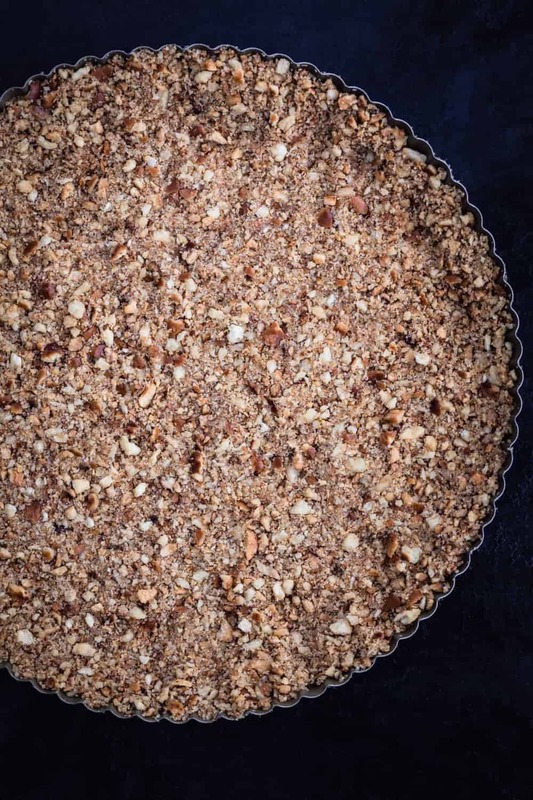 Pat pretzel crust mixture into tart pan. Combine chocolate, tahini and salt in bowl. Heat cream, vanilla, and sweetener. Pour cream mixture over chocolate. And use that elbow grease to mix! Pour filling into pretzel crust. I’ve seen recipes all over the internet for a similar filling so want to be clear that I am not claiming any sort of complete originality for this chocolate tahini combo. I wasn’t the first person to have a chocolate tahini dream and I surely won’t be the last. Not all tahini is created equal. 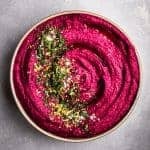 Use the best possible tahini you can get! Not all chocolate is created equal either. Get the good stuff! Really commit with that elbow grease to get that smooth, glossy, emulsified chocolate finish. For a big cheat, throw in all in the vitamix to do that work for ya. Have ya tried this recipe? I’d love to hear about it and see it too! Please leave a comment below and take a pic and tag it on Instagram with #wavesinthekitchen. 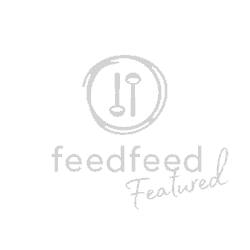 You can also follow me on Facebook, Instagram, and Pinterest to see more colorfully delicious food and all sorts of awesome adventures! 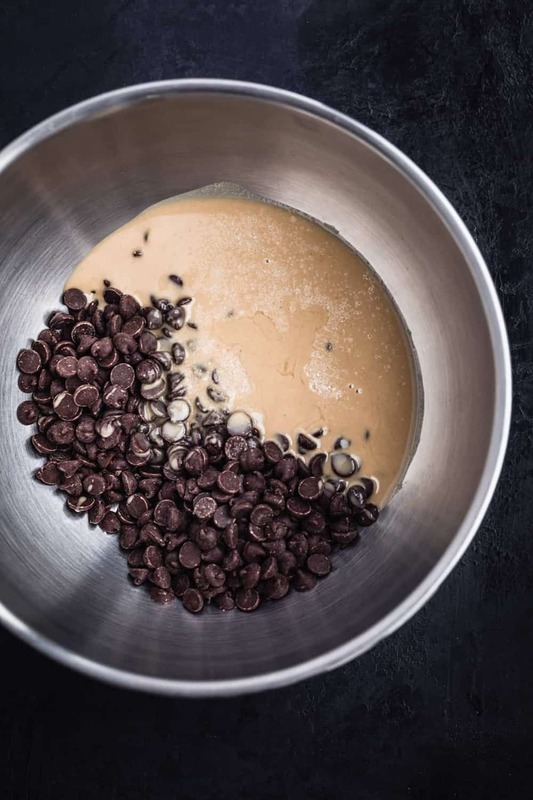 Let’s get our chocolate tahini game on and let’s make waves in the kitchen! Pre-heat oven to 350. 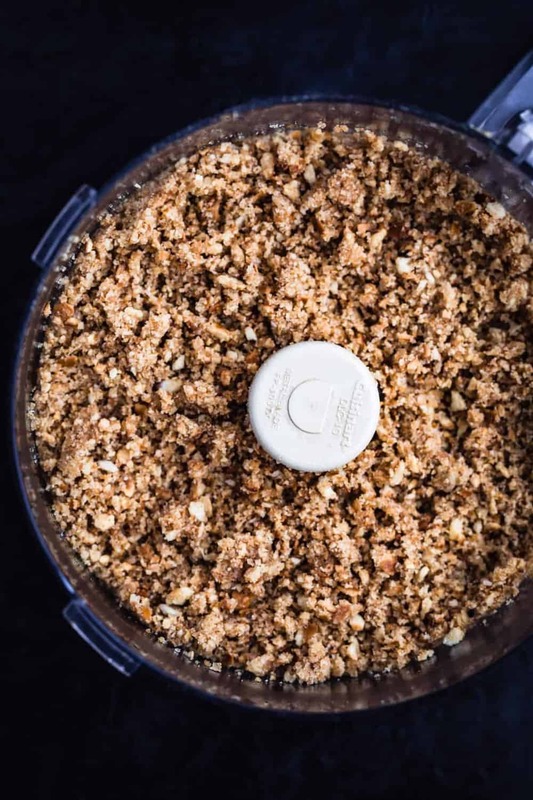 In the bowl of a food processor, add pretzel, and pulse small crumbs begin to form. Add brown sugar and melted butte and pulse some more, until all mixed together. Transfer mixture to pan, pressing into bottom and up sides. 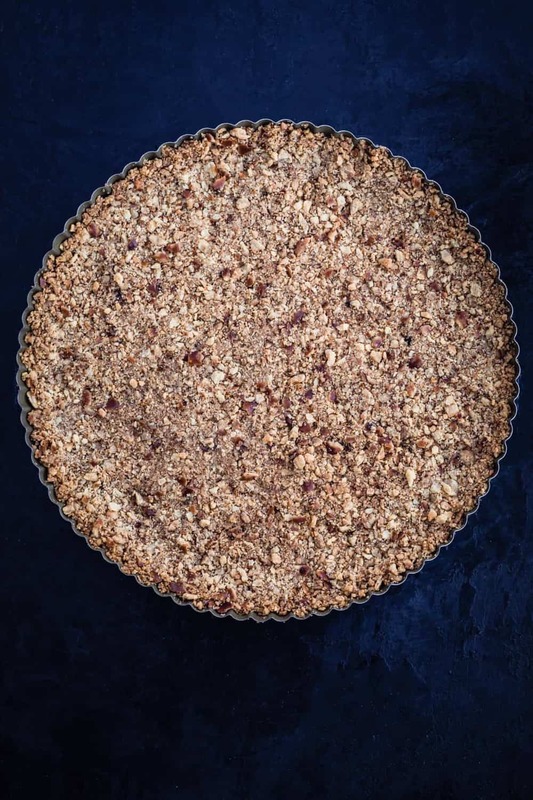 Bake pretzel crust until set, 10-15 min and let cool completely. 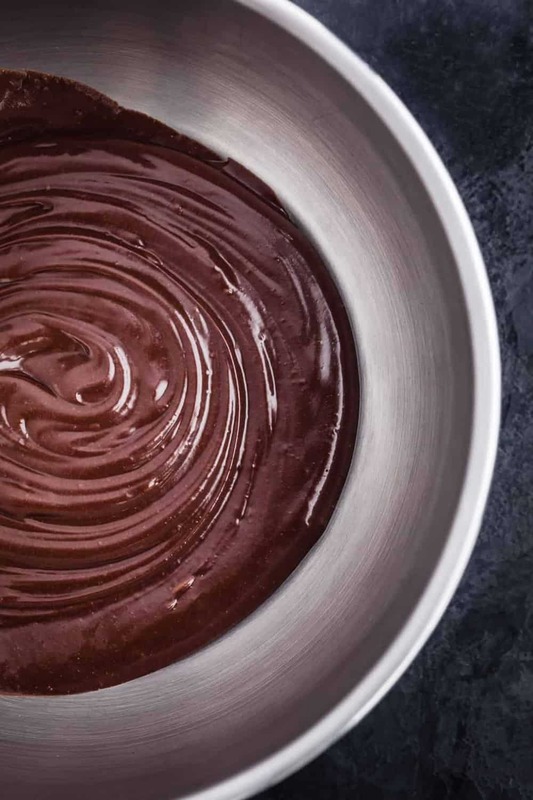 Combine the chocolate, tahini, and kosher salt in a medium bowl. 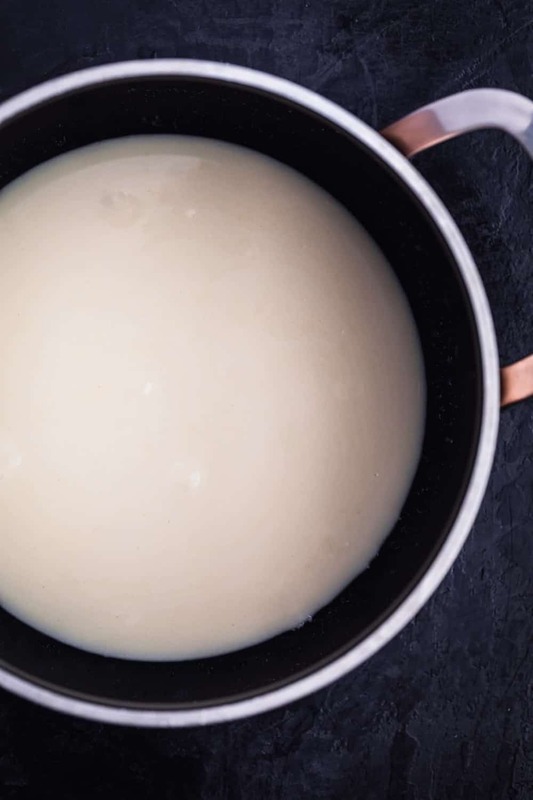 Heat the cream, vanilla and sweetener of your choice in a small saucepan over medium heat. Once it starts to simmer, remove it from the heat and immediately pour it over the chocolate and tahini. Let it sit for a minute or two to melt the chocolate. Using a spatula, mix until well blended and no bits of chocolate remain. Get that elbow grease in there! Use quite a bit of elbow grease here — really commit! 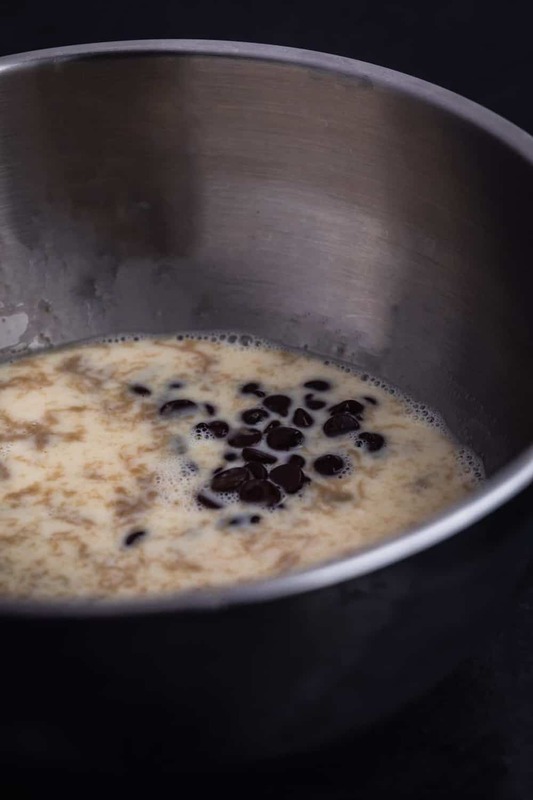 After a minute or two, the mixture should look thick, glossy, and well mixed. Immediately pour the filling into the cooled crust and smooth the top. Whisk cream, tahini and sweetener of your choice and swirl with a spatula on top and sprinkle with flaky salt (or other desired toppings). Let sit for at least 1 hour before slicing. 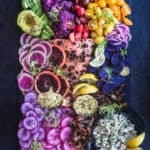 Dying to make it and eat it, so gorgeous and Delicious ?????? You are too cute! It is indeed so delicious :). Thank ya!!! ??? Greetings right back to ya from Cali! And thank you so much :). ?? Really appreciate the feedback! Thank ya :). ? So stoked to hear! Let me know how it goes :). ? Thank ya so much Mickal!!! Really appreciate it :). ?? Thank you so much Adriana!!! Love and appreciate the feedback :). ?? You got me with the word chocolate! I am a big chocolate lover so I would love to try this recipe. Stoked to hear Sarah! Please let me know how it goes :). ?? Yaya! And I must say that it does :). Thank you. ?? This sounds so yummy I need to try this!! Ya you do Natalie! Thanks so much for the feedback! And please let me know how it goes after ya try it… would love to hear :). Wow this looks amazing. I have been looking for a recipe like this. I will have to try it! Ya you do Sophia! Thanks so much for the feedback ~ really appreciate it! And would love to hear how it goes after ya try it :). MMMMM tahini…. it does wonders for those of us on dairy-free diets who want to enjoy the same textures and creaminess we’re used to. Yes it does! And the chocolate-tahini combo is dreamy! Thank you so much Amy for the feedback :). I will definitely try this recipe. It looks so damn delicious. Thanks for sharing this. Thank ya and thank you for commenting! Really appreciate it :). ?? Awesome! Please let me know how it goes ~ would love to hear! And that pretzel crust is one of the easiest cruststo make that ever was :). ?? Wow this is the first time to heard about tahini chocolate tart. That sounds deliciously incredible and perfect for parties. Thank ya and it so is!!! You’re def not alone in not having heard of the tahini/chocolate combo… that’s why I’m trying to do what I can to spread the good word! ?? My kids would absolutely love these. This would disappear in no time at our house! This is my kind of weekend treat. Yaya! So stoked to hear that!!! Please let me know what your kids think of it too :). ?? 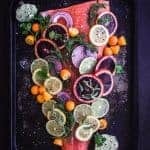 Wow, I have never tried to make this recipe looks really delicious and easy. I will try to make this for my kids, thanks for sharing! Absolute pleasure and please do let me know how it goes! Would love to hear :). ?? Rad!!! So super stoked to hear that! Please let me know how it goes :). ?? 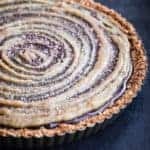 I have never heard of chocolate tahini tart but it looks super good. It sooooo is!!! Thank ya! Would love to her your thoughts if you make it :). Really appreciate the feedback!!! Thank ya :). ?? This looks so good! 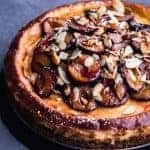 I haven’t made a homemade tart before but I would love to try it out. Thanks for sharing!